The blog for this course is now on-line. All further assignments for the tutorial will be found on the blog. The course will introduce students to mathematical visualization. Focus of the mathematical content will be symmetry groups, non-euclidean geometry, and modeling software..
To obtain a course certificate (Schein) students must complete a semester project, typically an interactive application developing a theme from the lectures. Students who choose to do so may also obtain a seminar certificate by presenting a lecture on the project to the Seminar of the AG Geometrie. Here are short descriptions of the projects. Click on the images to run the webstarts. This project from Marc-Steffen Zwisele and Andre Greiner-Petter explores wave equations on the flat torus and other selected surfaces. They offer a variety of approaches including separable Fourier series and discrete wave equation. They use colormaps to enhance the visualization, and have parallelized their code so that it takes full advantage of whatever computer it runs on. This project from David Speck and Katja Stumpp is an interactive tool for visualizing the intersection of the unit sphere with a second sphere such that the intersection is given by a set of circles on the unit sphere. 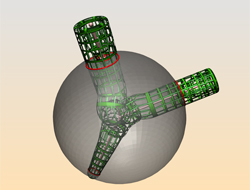 The second sphere is modeled by tubing a 3D graph determined by the intersection circles. 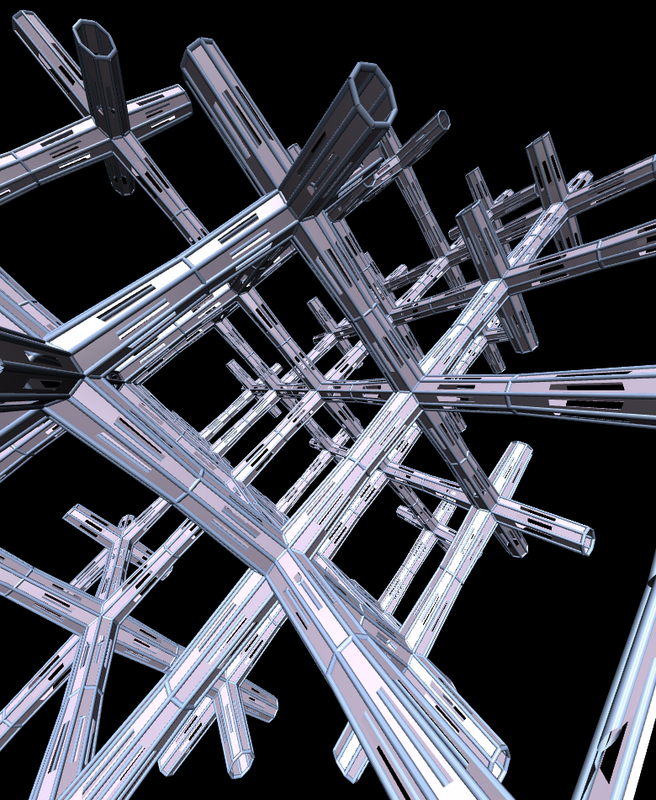 They work with Bezier patchs to model the tubes, and apply texture maps with holes to help the user see the overlapping surfaces which result. 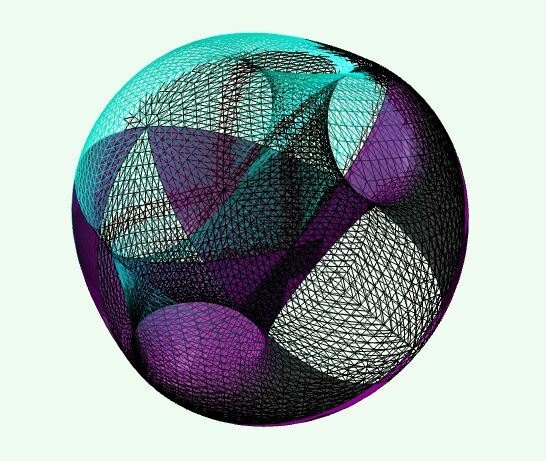 The project written by Franziska Lippoldt allows the user to explore the regular polyhedra generated by intersection of planes tangent to the sphere. It deals with different triangle groups and fundamental regions. This programme can be used to learn more about regular polyhedra for it provides descriptions about each solid. Whereas the regular polyhedra can be easily set up by using the Conway notation, the more experienced user will find satisfaction in moving the planes manually. 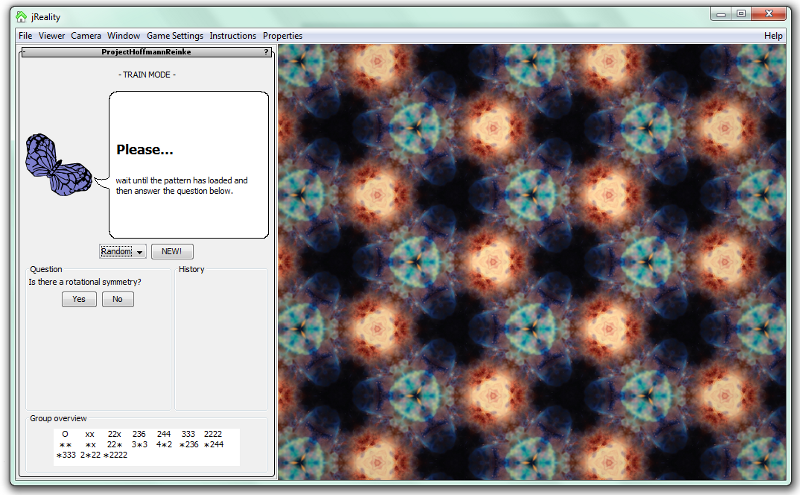 This project from Alex Guerten and Stephan Seidl is an interactive tool, for the creation of Escher-Tilings. 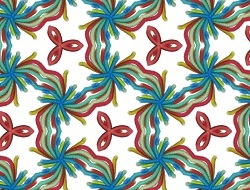 An Escher-Tiling is a repetitive pattern, which allows a complete covering (without overlapping) of a surface. 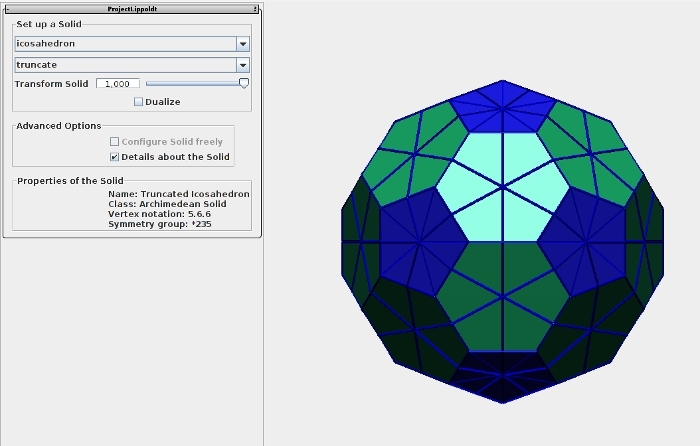 This program allows the user to alter existing tilings of the plane and the sphere with respect to their symmetry groups, to create more complex shapes. For the wallpapergroups it is also possible to colorize the shapes. Kai Ochenfels and Daniel Rehfeldt. "We implemented a 3D Kaleidoscope in the sides of a 3D tetrahedron, each side working as a mirror. The object to be tessellated can either be chosen as the intersection of a 3D hyperplane and the tetrahedron, where the hyperplane can be rotated and translated arbitrarily, or as a geometry loaded by the user. Furthermore, among other features, one of the mirrors can be disabled, leaving the Kaleidoscope with a maximum of 48 different reflections." 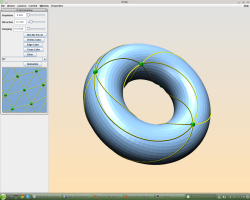 This Project from Nick Joneleit and Jakob Sonntag is an interactive tool for ODE on the torus and their solutions. 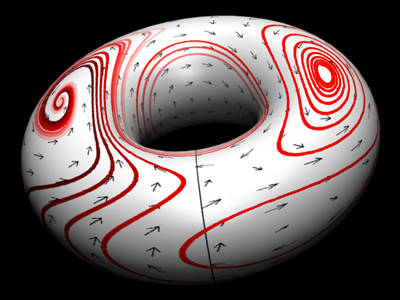 It provides different techniques of creating special ODE for the torus, by Fourier polynomials and Jacobi elliptic functions. With these functions, the user is able to explore and to create different vectorfields and, for a given initial value, their integral curves. This project from Peter Struempel and Eike Steinert is an interactive application, where the user can produce and explore Apollonian gaskets. 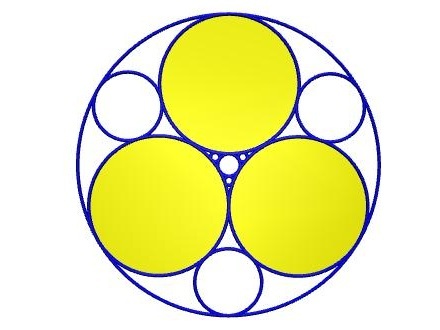 Apollonian gaskets are fractals made from three circles where everyone is tangent to the other two. 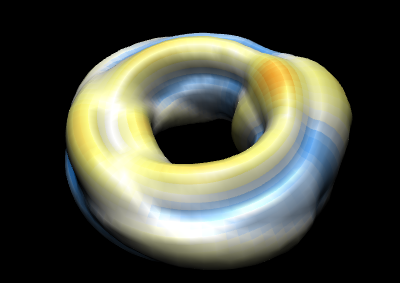 With on-going depth the circle-packing produces to infinitesimal circles, so the depth is limited to avoid errors in computations. But still the user can produce nice images. Katharina Hoffmann and Michael Rienke, the authors of this project, describe their application: "Our aim for this project was to provide an educational game that gives people (with basic knowledge in geometry) the possibility to earn a better understanding of the orbifold notion for wallpaper groups. We will present a game that supports you at finding the symmetries of a given regular pattern to understand the name in orbifold notation better." This project from Jude Connolly-Wright explores drawing on wallpaper groups. 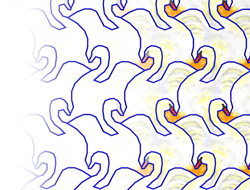 Each of the wallpaper groups is generated by rotating and reflecting a 'fundamental region', and Jude has worked on the idea of the computer creating aesthetically pleasing patterns by following mathematical algorithms chosen by the user in order to draw on the fundamental region in a certain way. This project from Robert Sieg and Richard Loewe is an interactive tool that deals with graphs on the torus. Due to its homotopy group, there are some non-planar graphs that can be embedded on the torus, for example, the complete graph wit 7 vertices. The user is able to inspect and edit an arbitrary graph, both on the flat torus and on the embedded one. The group has also adapted force-directed graph drawing to run on the torus. Gregor Hendel and Jim Lobsien. In the 1970's, H. Blaine Lawson presented a way to construct minimal surfaces of arbitrary genus on the hypersphere. Today, our project has two aims: On the one hand, we developed a tool to numerically approximate those minimal surfaces based on gradient search. On the other hand, the software comes with a variety of projection tools to visualize the resulting surfaces from different perspectives, making it possible for the user to have a 4D-flight experience. 12 pm Katharina Hoffmann and Michael Reinke, "Orbitrain: The Wallpaper Group Identifier"
12:45 Alex Guerten and Stephan Seidl, "Creation of Escher Tilings"
13:30 Richard Sieg and Robert Loewe, "Graphs on the Torus"
14:15 Gregor Hendel and Jim Lobsien, "Lawson Minimal Surfaces in S^3"
12 pm Nick Joneleit and Jakob Sonntag, "ODE's on the Torus"
12:45 Franziska Lippoldt, "Regular and Semi-regular Polyhedra"
13:30 Kai Ockenfels and Daniel Rehfeldt, "A 3D Kaleidoscope"
14:15 Eike Steinert and Peter StrÃ¼mpel, "The Apollonian Gasket"
15:00 Jude Connolly-Wright, "Dynamical Wallpaper Patterns"
We will use the Java libraries jReality and jtem (both developed here at TU Berlin) for technical realization of the projects. The resulting applications will then also run in the PORTAL . There is also a chance to use the 3D printing facilities at the 3D Lab in the Math building. Due dates for homework assignments are sharp: no extensions will be given without a medical excuse.